When you’re responsible for having to print a lot of documents on a daily or weekly basis, optimization can come in handy. FinePrint uses an innovative preview window that helps you save both ink and paper. Every time you go to print a document, you’ll have full control over the ink that’s used and the layout of the page, and you’ll even get the opportunity to delete any portions of the page that you don’t need. Not only will this small but powerful application optimize your entire printing experience, it could also end up saving you a ton of money in the long run. - A unique printing preview option that allows you to choose exactly what your final page(s) will look like. 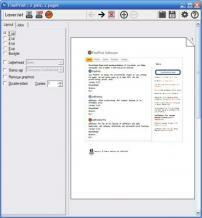 - Allows you to add blank pages and/or delete specific pages from your printing projects. - Gives you the opportunity to save on in with a tool that converts coloured text to black and removes all pictures from your documents. - Gives you the ability to save on wasted paper by allowing you to print on both sides. - Comes equipped with support for a variety of file formats (TIFF, JPEG, BMP, FP, text). - Lets you print up to 8 pages on a single sheet of paper. - Simplifies the creation of electronic forms and letterhead. - Supports the watermarking of documents. - At least 128 MB RAM. - The unregistered version prints a small banner on each page. Purchasing will remove the banner. A Simple Search-As-You-Type Text Reader and Filter.